The new Apple TV -Apple TV 4 finally put all the rumors to rest. Compare to the its former version - Apple TV 3, which is released in 2012, a lot has changed for this new set-top players. The most distinctive features is that the Apple TV 4 now has more apps to help liberate your television. Not only the already existed Netflix, Hulu, WatchESPN and iTunes to watch TV shows, but also some new and popular apps such as HBO, Hulu, Showtime, CNN, FOX, PBS Kids, Disney Channel, etc. People who have recorded a lot of TV shows with Tivo recorder may desire a way to watch Tivo recordings on Apple TV 4. The good news is that you can now use AirPlay to mirror your Tivo recordings to watch on Apple TV. However, you may fail to use Apple TV 4 to open some file recordings market with "Red Circle Slash" icon, the main reason is that those files are copy protected by Tivo company to restrict us from duplication. To address this issue, you will need a program to remove the copy protection from Tivo files. 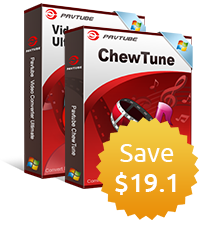 Pavtube Video Converter for Mac, which enables you to remove and convert Tivo recording to Apple TV 4 playable format for streaming with AirPlay with no problem. Follow the detailed steps below to convert Tivo to Apple TV 4 on Mac OS X. Step 1: Enter Media Access Key. 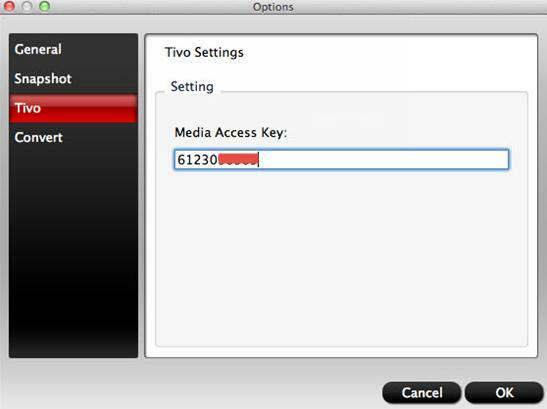 The copy protected Tivo recordings usually have a Media Access Key, you can find it by logging into your Tivo account at Tivo and clicking the "Media Access Key" link on the right side of the screen. Then hit the button on the main interface, in the pop out window, enter the Media Access Key for the Tivo files, then press the "OK" button. Step 2: Import Tivo files. 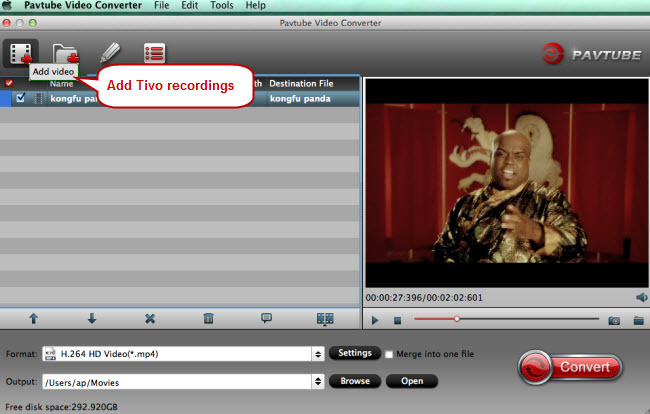 After entering the Media Access Key, you can successfully import Tivo files by clicking "File" > "Load Video/Audio" or "Load from Folder" to the program. Step 3: Define an output file format. Go to "Format" drop-down bar, select Apple TV 4 playable format from "Apple TV" > "Apple TV 3 1080p Dolby Digital Pass-through(*.m4v) ". 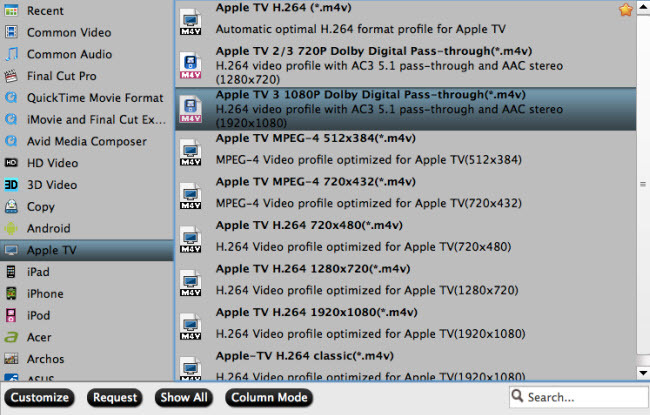 Step 4: Start Tivo recordings to Apple TV 4 conversion process. Press the right-bottom "Convert" button to carry out the conversion process. When the conversion is over, hit the "Open" folder on the main interface to find and locate the converted files, then you can stream converted Tivo recordings to Apple TV 4 by enabling AirPlay through the iOS control center, select Apple TV from the menu and toggle the "mirroring" button. After the device image is "mirrored," TiVo users can view recorded content on their Apple TV. For more Apple TV related topics such as Apple TV supported file formats, Apple TV related hot issues, Apple TV video/audio playback solution, please visit our Apple TV page.